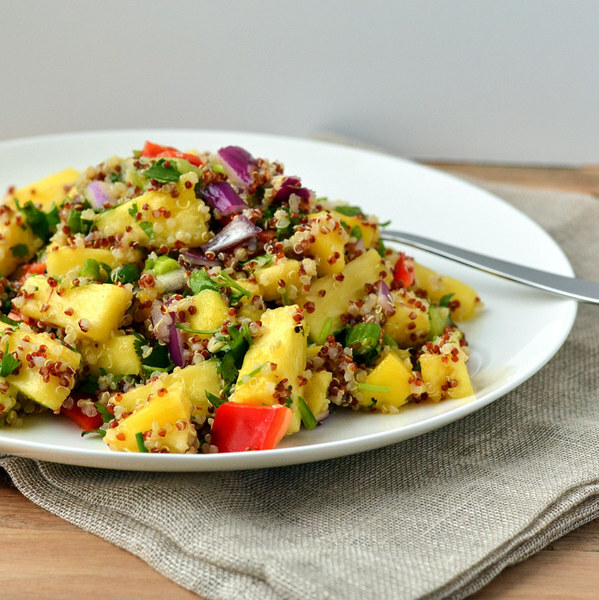 ← Tropical Fruit & Quinoa Salad with Honey-Lime Dressing. In a medium saucepan, combine quinoa and broth; bring to a boil. Reduce heat to a simmer, cover, and cook for 15 minutes. Remove from heat and let stand, covered, for 5 minutes. Cut off skin from pineapple, core, and cut into bite-sized pieces. Transfer to a large mixing bowl. Wash mangoes, kiwis, bell peppers, and jalapeños. Peel the mangoes, slice flesh away from pit, and medium dice. Peel and medium dice the kiwifruit. Seed and medium dice bell peppers. Seed and mince jalapeños. Peel and small dice onion. Add ingredients to bowl with pineapple. Peel and mince garlic. In a small mixing bowl, prepare dressing by whisking together garlic, lime juice, oil, honey, salt, and pepper. To serve, place salad in a bowl. Enjoy!